Rocky Mountain Chocolate Factory has become famous for its delectable collection of gourmet caramel apples, larger-than-life chocolate creations, and amazing gifts. Visit one of our more than 300 US stores and enjoy the experience as our staff makes fudge right before your eyes on a giant granite-marble slab. While you're there, you may also see them dipping caramel apples by hand or dipping large strawberries in milk and dark chocolate. Let Rocky Mountain Chocolate Factory help make gift giving a sweet experience! Rocky Mountain's gourmet chocolates demonstrate your high regard for customers, employees, colleagues, family and friends. Whatever the occasion, be it birthdays, holidays, or just pure appreciation, make a lasting and tasteful impression with delicious gourmet gifts from The World's Chocolatier, Rocky Mountain Chocolate Factory. 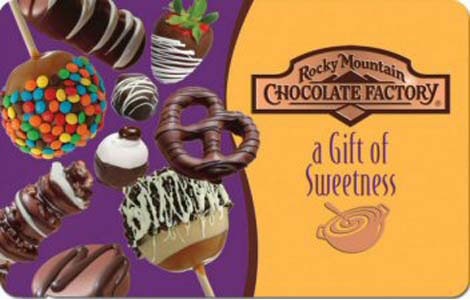 Use your gift card to make purchases at participating Rocky Mountain Chocolate Factory locations or online at www.rmcf.com. Gift Card may not be used to purchase other Gift Cards. This Gift Card cannot be redeemed for cash or applied as payment to any account unless required by law. The merchant is not responsible for value lost due to Gift Card being lost, stolen, destroyed, altered, or used without authorization. Terms and conditions are subject to change without notice. Purchase or use of this Gift Card contstitutes acceptance of these terms and conditions. For store locations, online purchases, and online card balance information visit www.rmcf.com. Visit us on Facebook at www.facebook.com/myrmcf. Customer Service: 1-888-525-2462.